Sonia McDonald is an expert in building leadership strategy, confidence and capability, and is renowned for her innovative approach to leadership, organisational development and neuroscience as it applies to leadership. Below Sonia gives some encouraging words to those looking to step up as a leader and just rock it! For years, the strong, decisive male was held up to us as the definition of a ‘leader’, but that is all changing. I think as our understanding of leadership has matured, so has our recognition of the qualities both genders offer. What we want from our leaders is different now. We want more emphasis on the people side of business. That’s certainly an expectation of the younger generations entering the workforce, and it’s something we women do well. Now women are stepping up as exceptional leaders, thanks to the human approach we bring to the role. What I’m saying is that if you’re ready to step up as a leader, now’s the time to do it. I’m tired of watching other women underestimate themselves, or minimising their potential. If you think you’d be a great leader, get out and do it. Don’t worry about what anyone thinks. Who cares what other people say? Follow your gut and pay attention only to what you think about yourself. Of course, it’s never as easy as that. Nothing ever goes smoothly, it’s all in how you handle yourself in the tough times. Maggie Thatcher and Julia Gillard didn’t have an easy time in politics, and look at what they achieved. They were the first female Prime Ministers of their respective countries. You might look at them and think, “Whoa, they’re tougher than I am.” At that level, they probably had to be! But they knew what they wanted, and they followed their dreams without being held back by worrying about what other people thought. New Zealand has a pregnant Prime Minister! Now, look at Jacinda Ardern the NZ PM. A few years ago, you’d have laughed at the idea. Yes, she’ll probably be criticised by some people, but have you noticed how excited the country is about this baby? The NZ people are right behind her. Of course, you can imagine the thoughts and worries running through her brain when she knew she’d have to break the news to everyone. She probably pictured a huge fallout. But it didn’t happen. Usually, our worries are all just in our heads, and we blow them out of proportion. We let our minds hold ourselves back over something that probably won’t happen. Ardern is rocking it as PM. She’s not letting anything hold her back from having the baby she has wanted for a long time AND being an amazing PM. If she can do that, YOU can do it, just rock it! YOU can be a leader at whatever level you want. You just have to decide to go for it. You know, you only discover what you’re facing, in a challenge. Challenge yourself and see what you’re made of. Give yourself a chance. Trust yourself. Step up as a leader and just rock it! 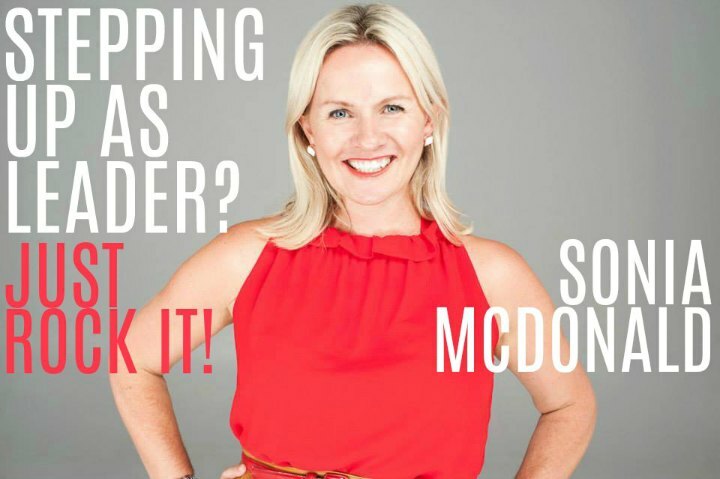 If you would like to know more about Sonia McDonald and her keynote presentations for your next corporate event click here to submit your enquiry or contact us directly on 1300 55 64 69. Thought leader, coach, consultant, facilitator, speaker and trainer, Sonia McDonald has over twenty years’ experience in human resources, management and organisational development. With expertise in the retail, education, construction and engineering industries, Sonia combines a broad perspective with a passion for inspired leadership and organisational excellence. Read more.